If you read part one of this blog series, you already know how important it is to educate yourself on the benefits of medical marijuana and CBD oil before meeting with a physician, as well as how being open and honest during your doctor appointment can make the conversation about medical cannabis easier. At Medical Cannabis Outreach, we are honored to help patients gain access to medical marijuana treatment and CBD oil via Illinois’ Compassionate Use Of Medical Cannabis Program, and it all starts with written approval by your physician. That being said, here are some more tips for how to talk to your doctor about medical cannabis. Even though you’ve done your research at home, it is important to remember that you are not a doctor and that your physician may be able to offer some insight that has never crossed your mind. Since medical cannabis is still in the early stages of governmental research and has yet to gain full acceptance in the medical community, your doctor may not know much about dosages, strains, methods of consumption, etc. However, they might know a thing or two from experience. It is likely that your doctor has discussed the healing potential of medical cannabis with other medical professionals and holistic healers, as well as patients who have undergone medical marijuana treatment, themselves. Keep in mind that doctors are humans, too, and that they are always accruing knowledge about their practice, whether that be different health conditions, medications, procedures, therapies, or natural health remedies like medicinal marijuana. Perhaps they’ll have a peer-reviewed article to share with you or could point you to another physician who is more knowledgeable about how THC and CBD work in the body. Don’t be afraid to ask, “How does medical cannabis help people manage pain?” or “What do you know about CBD for cancer?” Sometimes, all it takes to ease the tension during this sometimes awkward conversation is to be informed, but still ask questions, and be open to hearing different perspectives on the issue. It is also worth it to make note of your body language and tone when you ask questions about medical marijuana because you don’t want to start off on the wrong foot. Nothing turns a doctor off like a patient who thinks they’re an expert on an issue, especially a “Schedule I drug” (though you cannot overdose or become addicted to medical cannabis). So, before you visit the doctor, assume a humble disposition and prepare to express your curiosity, rather than rattling off a list of facts or claims with little evidence right when you step in the door. Aside from doing your research about medical marijuana beforehand and ensuring that you have a qualifying health condition before entering the doctor’s office, the most important thing to do is keep a level head when you talk with your physician. It’s no secret that medical marijuana is a touchy subject, so go into the appointment calmly and feel out your doctor’s attitude on the subject before diving right in. When your physician asks why you came to see them, try something like, “I am interested in alternative treatment options for my medical condition,” rather than, “I’m here to get your approval for a medical marijuana license.” Odds are when you phrase it in a broader, less controversial way, they will sit down with you and discuss options like vitamins, supplements, and when the moment feels right, CBD oil and medical cannabis. 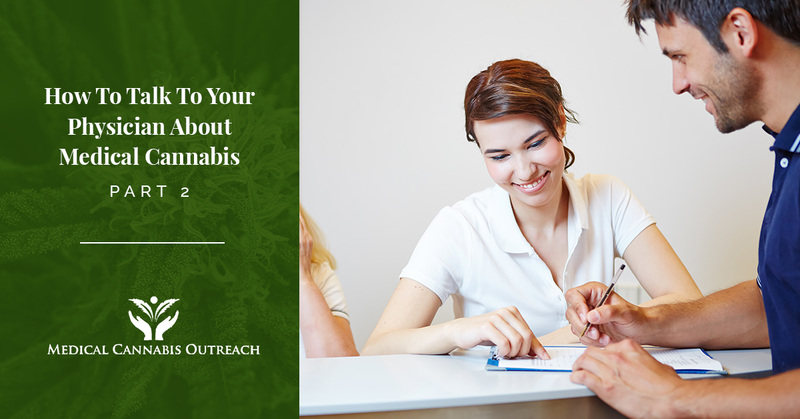 Easing into the conversation is key when consulting your doctor about medical marijuana, as this makes them feel valued as a resource, rather than a means to an end. The last thing you want is to confront your doctor with a know-it-all attitude about the benefits of marijuana because they are the one with the medical degree and years, if not decades, of experience in the healthcare industry. However, this does not mean that you need to walk on eggshells with your doctor — just be respectful, engage them in a meaningful conversation, and keep a level head the whole time. Don’t let your emotions get the best of you, and if it comes time to walk away, do so with poise. At Medical Cannabis Outreach, we understand how daunting it can be to talk to your doctor about beginning medical marijuana treatment or using CBD oil, which is why we have a team of in-clinic physicians ready to evaluate you for a medical card. Our team is certified and willing to provide free consultations, where you can quickly get approved to apply for a medical marijuana card in Illinois if you have a qualifying health condition. Medical Cannabis Outreach is the one-stop-shop for medical marijuana licenses in Savoy, Chicago, Pekin, and three other locations across the state, so you can rest assured that we’ll make the medical card process as hassle-free as possible. Our friendly and experienced clinicians offer application assistance (with no application fee! ), will explain registration terms and veteran/SSDI discounts, and can take your photo for the medical card ID. We also offer mobile wellness clinics and regularly hold educational seminars throughout the area, so feel free to use our clinicians, physicians, and medical marijuana experts as a resource during your journey to health and wellness with medicinal cannabis. Interested in learning more about how medical marijuana or CBD oil can aid in symptom and pain management for a variety of health conditions? Contact us today with any questions or concerns you may have, or visit one of our six medical marijuana clinics in Illinois for more information. We look forward to meeting you and helping you get approved for a medical cannabis card!